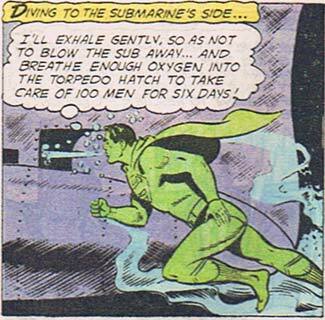 Random Panel: Coming up at 11, Superman forgets you exhale CO2, not oxygen, killing hundreds! 7 Responses to Random Panel: Coming up at 11, Superman forgets you exhale CO2, not oxygen, killing hundreds! I wondered that too Luke, but they said the submariners opened some valves to let the air in. I don’t know how they managed that without also letting the WATER in, but then, I’m no expert. Plus, let’s hope he at least took a super breath mint, you know? Submarines *can* open hatches to the water, but they do it on the underside so the water doesn’t come in. The air pressure plus gravity is enough to keep out water. It’s also a fun science principle to show kids B-).